Your Adventure begins climbing up 24 steps to the top of this radical Tropical Palm tree slide. When you can overlook the whole jungle! Sit down cross your arms and feet and your in for a crazy ride down. 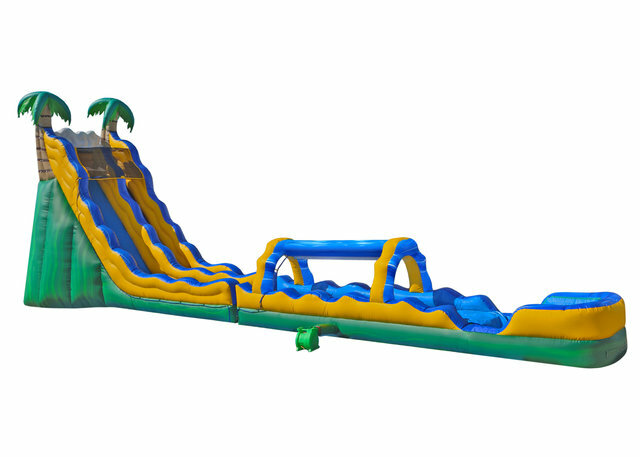 With 60' total feel of fun you rish down the waves of the island into a pool of fun! This tropical slide is one of the kind and the only in the WNY Area. Grab your explorers (Adults & Kids) and rush your way up the nonslip surface up the slide. This unit is great for all ages, 10 Years old and up.